Strategies for creating optimal learning environments were discussed by a visiting expert at Weill Cornell Medicine-Qatar’s Grand Rounds. The vision of Qatar’s leadership to develop and train medical professionals and build national healthcare capacity has been supported by new research conducted by Weill Cornell Medicine – Qatar. WCM-Q final year medical students have matched with residency programs at some of the world’s most prestigious university hospitals. 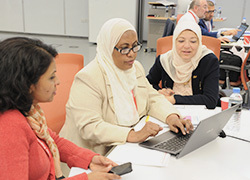 Researchers from leading institutions across Qatar convened at WCM-Q’s ninth annual research retreat to discuss the latest developments in biomedical science. The college’s affiliated faculty members work in a variety of institutions, sharing their knowledge and experience with the next generation of graduate doctors.